The Benromach distillery in located in the northern of Forres, just off the A96 in Speyside, Scotland. 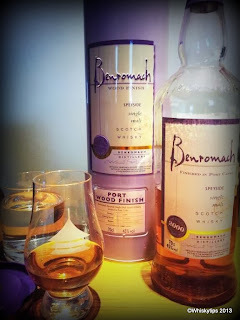 Benromach was founded back in 1898 by Duncan MacCallum and F.W. Brickman. The distillery has an on and off history of production (as many other distilleries by the way). The own floor maltings stopped in 1968 and in 1983 the distillery was closed and dismantled. Fortunately independent bottlers Gordon and MacPhail (one off the largest, if not the largest in Scotland) saw this as an opportunity for a constant supply of their own malt whisky not far from their head office in Elgin. They decided to buy Benromach in 1993 from United Distillers (Diageo). After this, other independent bottlers followed them by buying (Signatory) or building a distillery (Adelphi). All new equipment was installed (except for the spirit safe that came from Millburn distillery) and the refurbished distillery was officially opened in 1995 by Prince Charles. The first bottling from the new production was released in 2004. Story goes that after going back into production, United Distillers gave Benromach a box of new-make samples from before closure and the spirit character turned out to be quite identical. Only the water was the same. Although Benromach doesn’t do its own floor maltings anymore, it’s still a handcrafted whisky, being produced by only two men. The measuring of the volume of the casks after filling for example is done with the old gross and tare system (Weighing the casks before filling) instead of using automatic gauges. The yearly capacity of Benromach is 500,000 litres of alcohol per year, but in 2012 less than 150,000 litres were produced, making Benromach the smallest working distillery in Speyside. The distillery also has a visitor centre awarded four stars by the Scottish Tourist Board. The good news is that more and more people worldwide are picking up this small batch malt whisky (most of the production is marketed as single malt), so Gordon and MacPhail decided to double production and an extra employee will be added to the current staff. After this introduction we finally come the tasting notes of this Benromach Port Wood Finish expression. Benromach has done more Port Wood Finishes, this one is distilled in 2000 and bottled in 2012. It was finished for a period of 8 (!) year in Port Casks. Now this raises the question what is the definition of a finish. Maybe the Scottish Whisky Association could step in. The whisky is bottled at 45% ABV strength. Just 1460 bottles were released in this batch. Concluding remarks: Benromach fans as we are, we tend to be a bit biased, but this is definitely one of the better port wood finished whiskies. Some port wood finishes simply to have too much of the port character and this one goes very well with the smoky/ashy tones that characterizes Benromach so much. Be quick to get a bottle though, since there are only 1460 (-1..) around.